As a participant in the press conference and as someone who once supported organizations like the Family Research Council and other anti-gay religious organizations, it was exciting to see these individuals and groups offering up a different voice and a much different Christian message to the LGBT community and other faith communities. Last week, I was contacted by two young men who stated that they had been victims of mistreatment by their church because of their sexual orientation. One of those individuals described a series of physical beatings he said he had endured at the hands of church members. He says they forced him to sit in a chair while they screamed at him, slapped him in the face, punched his chest and at one point choked him. He said the bruises have healed but the emotional and psychological wounds still gape. Two weekends ago, I was at a Pride festival in a small community where the first Pride event in the city’s downtown area was taking place. The organizers were indeed proud to be making such a positive statement to the area’s LGBT youth. But that morning a group of about 12 anti-gay religious protestors were allowed by police to actually enter the festival’s small midway. For four hours, they were allowed to walk back and forth chanting and yelling that gays were going to hell, gays were a threat to children and society and that God was going to punish them – all beneath the banner of Christian faith. Many civil Christians sit back and say how awful, how rude and how we are not like that. And church members actually beating up someone because they are gay? That’s just extreme. Yet the anti-gay religious factions operating under the banner of the Values Voters Summit parade through the midway of our societal consciousness with the same vocal, boisterous and condemning message. The churches who support them are indeed beating up on gay, lesbian, bisexual and transgender people – and for LGBT youth and their families the abuse often proves tragic. The police at that Pride festival apparently thought it was okay to allow those anti-gay protesters to mistreat festival goers. Perhaps it is because there are still people who think it is still okay for churches to mistreat gay people in America. According to them, it is okay for churches to beat up on LGBT youth. It is okay to judge and condemn them. It is okay to invade their emotional and psychological space with signs and loudspeakers and intimidate and inflict emotional and psychological trauma. It is okay for pastors and Christians to make a 12-year-old kid feel that taking their own life would be better than growing up gay. I have been harping on a central point that often goes missing when people talk about bullying and anti-bullying legislation. Christian Right leaders argue that there is no need to specifically include LGBT people in anti-bullying programs because, they say, they are against all bullying. That is simply untrue. Those who take the time to understand the experience of LGBT people in America know that when it comes to being bullied for being LGBT, schoolyard taunts are just the tip of the iceberg. The most cruel bullying, for so many people, tends to come from the churches Brent speaks of, from the pastors and congregants they’ve been taught to respect. It comes from Religious Right organizations like the American Family Association and Family Research Council, who have gambled that the best way to keep the CA$H coming in is to use LGBT people’s lives as a wedge to stir up resentment among donors who don’t know any better, who are still persuadable that LGBT people are the greatest threat facing American society. 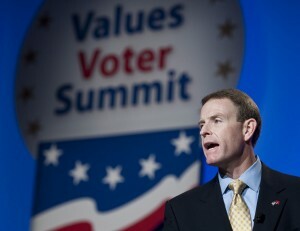 Those people and organizations don’t have any business existing in the same sentence as the phrase “values voters,” that is, unless that phrase is immediately preceded by the words “completely devoid of.” Because, while directly hurting LGBT kids is probably not the first priority of the FRC and the AFA (that first priority, again, would be CA$H, relegating “hurt LGBT kids” to a close second), that’s what they do. It’s their bigotry that fuels the abuse that so many LGBT people have been dealt at the hands of those who they’ve been taught to view in life as moral arbiters, and it’s their bigotry that trickles all the way down to the garden-variety schoolyard bully who beats the crap out of a gay kid during recess, because he’s gotten the message that to be a fag is the worst thing possible. That sort of bigotry must be taught. But indeed, and thank god, it’s true that Christians are Not All Like That, and that more and more of them are standing up to say so, and to say clearly that anti-gay Christians, from the money-hungry charlatans in Washington and Tupelo to the backwoods preachers a few miles outside of Tupelo, decidedly do not speak for their faith. We Christians must let our pastors, fellow church members, family members and acquaintances know that our faith perspective cannot partner with a message that brings harm to LGBT individuals, especially young children and families. If Christian faith communities continue to sanction religion-based bigotry’s harm, tarnishing a political brand is not an outcome we should be most concerned about. Attempting to couple such harm with Christ’s love indeed is a mockery – and the outcome may be far more serious for the church than winning or losing political contests.